The Silver Series is available in two widescreen models (7 in. and 10 in. diagonal display sizes). It supports a full set of features including serial and Ethernet communications with multiple controllers, USB, SD Card, data logging, flexible password security and multi-language support. The Silver Series programming software, EasyBuilder5000, features a large variety of built-in screen objects and extensive graphics libraries that make it easy to use and very powerful. The online simulator and the Ethernet and USB ports make testing and downloading fast. 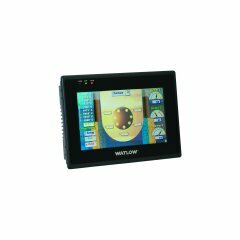 The Silver Series operator interface terminal paired with Watlow® controllers is the perfect solution for your industrial process or machine control application.